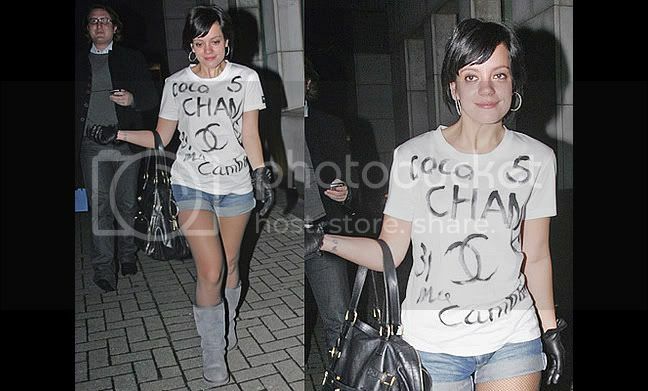 Lily Allen caught Uncle Karl’s attention when her first album came out and she’s been spotted wearing Chanel on many occasions – from Chanel’s Matyroyshka Doll purse to the homemade double C’s. Rumors and sneak peeks have been swirling online surrounding Lily Allen ads for Chanel and on Monday, photos from the campaign were publicized. Lily Allen was shot for the “Coco Cocoon” campaign and the looks were very inspired by Holly Golightly, the infamous character from Breakfast at Tiffany’s that Audrey Hepburn brought to life. From the black glasses, tiara, gloves and bouffant, Lily Allen mixture of innocence and sass makes her a great 21st century Holly Golightly. The “Coco Cocoon” collection features lightweight nylon and lambskin leather totes that come in an understated palette of black, ecru, navy and beige. All of the bags are reversible and when you turn them inside out, they reveal a side that is quilted garnet – the original lining color of the 2.55 bag. I love the idea of referencing the garnet of the original bags, but the shade they chose for this collection is a bit too burnt orange – I wish it were a brighter red instead. I think the idea of a lightweight nylon quilted bag is cute and would be great for travel since they start out so lightweight. Now, they just need to make some cocoon coats to go with the cocoon bags – just in time for winter. The “Coco Cocoon” collection debuts in October 2009. P.S. – Lily Allen’s It’s Not Me, It’s You dropped yesterday! You can get your copy here. Check out the video below where Lily talks about her new album. I love the black cuff! And the charm bracelet with black and white pearls and shoe, Cs and purse charms is insane! Remember the carousel from the runway show? It’s come to life in a few pieces of costume jewelry. Sigh, the shoes that are perfect with the tights. So many beautiful bags to choose from. I love the square quilt on the black bag and the chain on the grey bag on the right. OOh! A bow and camelia all in one! An iconic brooch with Maltese Cross – a Chanel must have. One boomerang you’ll be glad will come back to you. And more shots from the Chanel Fall 08 Look Book – so dark and moody. I love it! With ever tightening security measures Karl Lagerfeld seems to have come up with a way to get through security quickly for trendy jet setters – the “naked” bag. Check out Chanel’s Naked Bag line, it ranges from different shapes in 4 colors (white, gold, black and grey). I’m not too sure I like ‘clear’ bags, not really feeling people looking at what I have inside. Its bad enuff when I rock my LV Perforated Speedy, they stare hard to see if they can see what’s inside my bag haha. But this can be cute if its in the other colors, just the clear white is too extreme for me.